PropertyWala.com is a winner again! We are excited to announce that PropertyWala.com has been voted the best real estate website of the year for the second year in a row! PropertyWala.com, launched in Jan 2008, continues its tradition of innovative and affordable advertising in real estate. 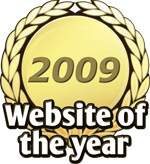 We would like to thank you for your continued support in making us the best website yet again in our second year (also voted best in 2008). The Website of the Year awards are the largest annual ‘people’s choice’ website awards and have organized since 2004 by MetrixLab, an independent online market research agency, in association with Neilsen Online & Mashable. The title ‘Best Website of the Year’ is provided to the website with the highest average score on content, navigation and design in its category. This year, 221 websites were nominated over 18 categories. More than 1,500,000 votes were cast between November 3 and December 8 2009. PropertyWala.com was voted best among 12 websites nominated in the real estate section. Complete results of the poll are available at http://www.websiteoftheyear.co.in.